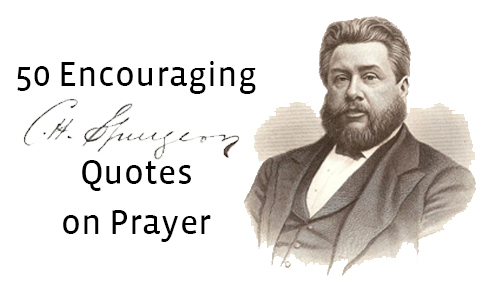 These encouraging quotes about prayer come from Encouraged to Pray: Classic Sermons on Prayer by Charles Spurgeon. To make prayer of any value, there should be definite objects for which to plead. My brethren, we often ramble in our prayers after this, that, and the other, and we get nothing because in each we do not really desire anything. Now, my own soul’s conviction is, that prayer is the grandest power in the entire universe; that it has a more omnipotent force than electricity, attraction, gravitation, or any other of those secret forces which men have called by names, but which they do not understand. God has promised to hear prayer, and he will perform his promise. Sometimes we think we are too busy to pray. That also is a great mistake, for praying is a saving of time. Unless I believe my prayer to be effectual it will not be, for on my faith will it to a great extent depend. Christian, look up then and rejoice. There is always an open ear if you have an open mouth. There is always a ready hand if you have a ready heart. 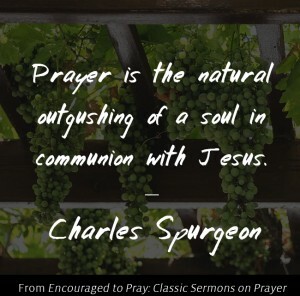 Prayer is the natural outgushing of a soul in communion with Jesus. Just as the leaf and the fruit will come out of the vine-branch without any conscious effort on the part of the branch, but simply because of its living union with the stem, so prayer buds, and blossoms, and fruits out of souls abiding in Jesus. Hearts abiding in Christ send forth supplications as fires send out flames and sparks. True prayer is measured by weight, and not by length. A single groan before God may have more fullness of prayer in it than a fine oration of great length. The best praying man is the man who is most believingly familiar with the promises of God. After all, prayer is nothing but taking God’s promises to him, and saying to him, “Do as thou hast said.” Prayer is the promise utilized. A prayer which is not based on a promise has no true foundation. Nor should a true Christian relax his prayer through mental difficulties, I mean those perturbations which distract the mind, and prevent the concentration of our thoughts. Such ills will happen to us. It is a grand thing when the soul can bolt the doors against distractions, and keep out those intruders; for then it is that prayer and faith will perform their miracle, and our soul shall be filled with the blessing of the Lord. 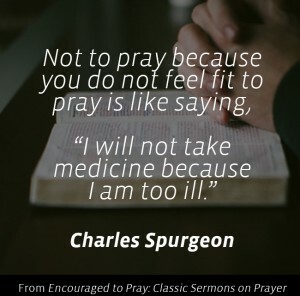 Not to pray because you do not feel fit to pray is like saying, “I will not take medicine because I am too ill.” Pray for prayer: pray yourself, by the Spirit’s assistance, into a praying frame. If I feel myself disinclined to pray, then is the time when I need to pray more than ever. We often pray best when we stammer and stutter, and we pray worst when words come rolling like a torrent, one after another. God is not moved by words; they are but a noise to him. He is only moved by the deep thought and the heaving emotion which dwell in the innermost spirit. The Lord hears the poor, and the ignorant, and the needy; he loves to hear their cry. 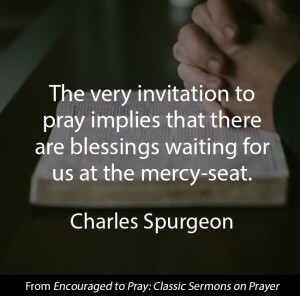 Prayer occupies a most important place in the life of the Christian. Do you always remember, beloved, in coming to the mercy-seat, that you are coming to a King, and to One who gives like a King? Do you always open your mouth wide, and ask great things of the King who is so ready to bestow them upon you? Think not that God will be angry with thee for asking too much from him, and imagine not that thou wilt insult him by asking him for little things. If thou art a believer in Jesus, God is thy Father, so speak to him as thou wouldst to thine earthly father, only have far more confidence in coming to him than thou wouldst have in approaching the most affectionate earthly parent. Prayer is often the shadow of God’s coming blessing. There has never been an instance yet of a man really seeking spiritual blessings of God without his receiving them. It is the power of the Holy Ghost in us which creates all real prayer, even that which takes the form of a groan because the mind is incapable, by reason of its bewilderment and grief, of clothing its emotion in words. A mother can translate baby-talk: she comprehends incomprehensible noises. 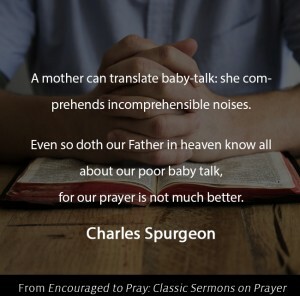 Even so doth our Father in heaven know all about our poor baby talk, for our prayer is not much better. That prayer which came from heaven will certainly go back to heaven. If the Holy Ghost prompts it, the Father must and will accept it, for it is not possible that he should put a slight upon the ever blessed and adorable Spirit. We do not forget to eat: we do not forget to take the shop shutters down: we do not forget to be diligent in business: we do not forget to go to our beds to rest: but we often do forget to wrestle with God in prayer, and to spend, as we ought to spend, long periods in consecrated fellowship with our Father and our God. 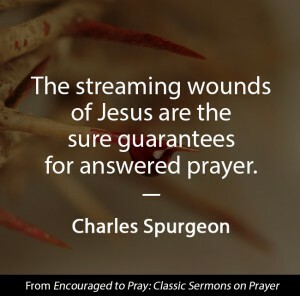 The streaming wounds of Jesus are the sure guarantees for answered prayer. If there be anything I know, anything that I am quite assured of beyond all question, it is that praying breath is never spent in vain. The best way by which a prophet and teacher and learner can know the reserved truths, the higher and more mysterious truths of God, is by waiting upon God in prayer. The saint may expect to discover deeper experience and to know more of the higher spiritual life, by being much in prayer. My dear friends, wait upon God much in prayer, and you have the promise that he will do greater things for you than you know of. When joy and prayer are married their first born child is gratitude. If I am to pray without ceasing, then every second must be suitable for prayer, and there is not one unholy moment in the hour, nor one unaccepted hour in the day, nor one unhallowed day in the year. Nothing can set a barrier between a praying soul and its God. As we breathe without ceasing, so must we pray without ceasing. Never, never, never renounce the habit of prayer, or your confidence in its power. He who prays without ceasing uses many little darts and hand-grenades of godly desire, which he casts forth at every available interval. Praying is the end of preaching. Preaching is but the wheat-stalk, but praying is the golden grain itself, and he hath the best who gets it. I believe that no man loves prayer until the Holy Spirit has taught him the sweetness and value of it. You need fear no foe if you can but pray. You need always to pray, for you always want something. In no condition are you so rich as not to need something from your God. Dear brethren, if we shut our ears to what Jesus tells us, we shall never have power in prayer, nor shall we enjoy intimate communion with the Well-beloved. An obedient heart is needful if there is to be any happy converse between God and the soul. God will not draw inconsistent professors and those who are dallying with sin into close contact with himself. Your life, your heart, your whole being should be one perpetual discourse of the lovingkindness of the Lord, and your heart, even if the Lord be silent, should carry on fellowship by adoring his blessed name. I never expect, until I get to heaven, to be able to cease confessing sin every day and every time I stand before God. 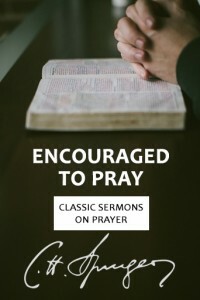 Encouraged to Pray: Classic Sermons on Prayer by Charles Spurgeon is available in paperback and for Kindle. 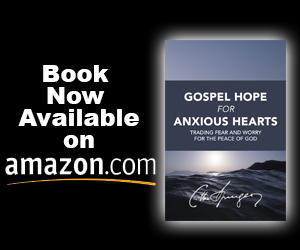 You may also be interested in Gospel Hope for Anxious Hearts: Trading Fear and Worry for the Peace of God. 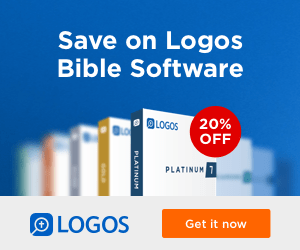 Read 40 Spurgeon quotes on anxiety, fear, and worry.